Telnet, which stands for “teletype network”, is one of the oldest protocols on the internet. Telnet’s both a protocol that uses TCP and the name of a program that uses telnet. Telnet is considered an insecure protocol because the connection is not encrypted but for BBS purposes that doesn’t matter. 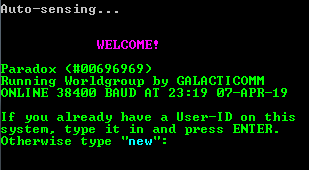 For BBS purposes, we use telnet as a protocol to connect to BBS systems that are capable of supporting the telnet protocol. There are several excellent telnet-capable communications programs available for different operating systems. Here’s a small selection for the most popular programs and OSes in no particular order: Syncterm (Windows, Linux, OS X, BSD), Netrunner (Windows, Linux), Qodem (Windows, Linux, OS X, BSD), mTelnet (Windows, OS/2), and ZOC [formerly Zap-O-Comm] (Windows, Linux, OS/2 [older versions]). All are free or open source except ZOC which is a shareware program. The Windows version of Netrunner comes with the monthly Telnet BBS Guide listing “pre-loaded” with the Guide. There is an excellent FAQ about telnet hosted at telnet.org. You can find the official RFC (RFC 854) that defines the telnet protocol here.